The New Mexico Mining Museum is all about uranium mining in this area of New Mexico and doubles as the local visitor center. It has a mock up of an underground mine that is an example of what the work conditions would have been like for the miners. Hands-on exhibits are made for kids, who will dig descending the mine shaft into the underground mine. The initial boom in the Grants area started soon after Paddy Martinez, a Navajo sheepherder, found uranium-bearing outcrops in the Todilto Limestone Member of the Wanakah Formation at the foot of Haystack Butte in the spring of 1950. Hours of operation: Monday through Saturday 9:00 am to 4:00 pm. Closed Sunday. The penny machine is inside to the left of the front entrance. You must line up the red dot on the wheel with the green taped on sticker for the penny to press correctly. The staff will help you with this, as the correct setting does vary with time. 4. 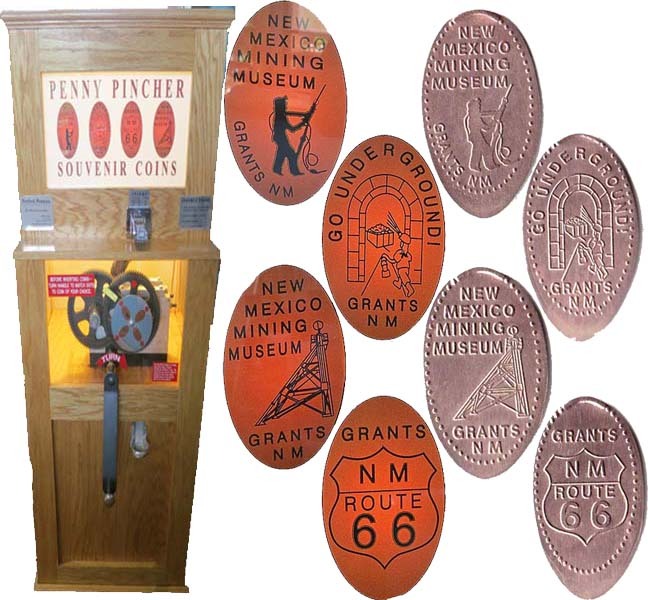 (V) US highway shield with Grants NM Route 66 .
thegillion added New Mexico Mining Museum to system.